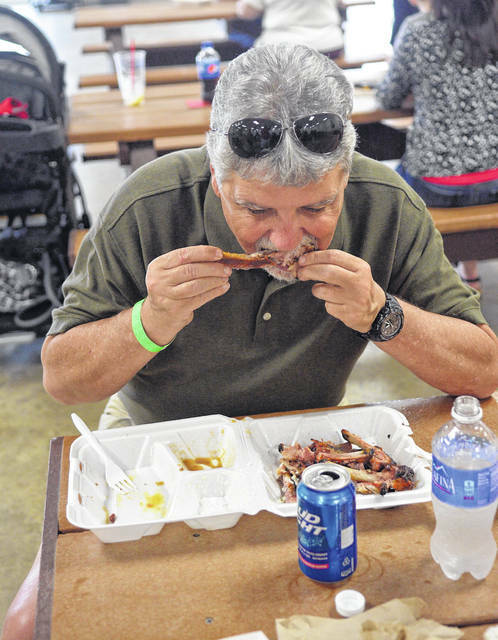 Brent Heppeard, of Van Wert, devours some ribs at a past event. ADMISSION: $5, $10 after 8 p.m. Kids 12 and under are free. “We’re the same company. This is our third time there. We took a year off to redesign what we were doing. We do these festivals around the state of Ohio, but this year we are a completely redesigned festival. This year’s festival will be much bigger and much better. We revamped the whole thing to make it more friendly for everybody. It should be a lot of fun for everyone,” said Dan Hurst with PigMania. The festival starts tonight with a bike night. Bikers can show their motorcycle license at the door and their first beer is a penny. There will also be a hay bale toss for bikers. On Saturday, the festival opens at noon. There will be a hale bale toss, a celebrity rib-eating contest with radio personalities, TV personalities, fire personnel and police personnel, a car cruise-in as well as a People’s Choice barbecue competition. “From 3 to 4 p.m. the general public will be able to sample for free and vote on their favorite barbecue made by the pros. We’ll have eight different pro teams competing in that, so it will be in one of the buildings there. We’ll set out tons of samples for everybody,” said Hurst. The pros come from all over the United States to battle in a competition sanctioned by the Kansas City Barbecue Society. “PigMania is the largest name in professional barbecue competitions in the country. We have 31 teams signed up to compete. These guys are coming from all over the United States for these contests. In Lima, the prize purse is $5,750,” said Hurst. Entertainment will be featured both nights. “We did take a year off to redesign the festival and we really hope that everyone enjoys what we’re doing out there. It should be a real blast for everybody. There should be a lot more excitement and a lot more going on for folks,” said Hurst.